LC20 will literally melt (soften and emulsify) carbonaceous deposits into colloidal graphite � an effective lubricant. 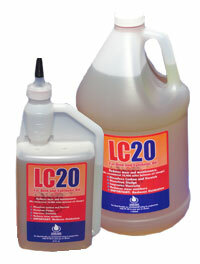 LC20 keeps your oil in good condition and reduces oxidation so well that oil change intervals can be extended. We recommend changing oil at 10,000 miles when adding LC20 every 1,000 miles. LC20 works with all forms of motor oils, including synthetic, and has a variety of uses such as end of season storage, removing carbon and varnish, and pre-conditioning the rings before startup. This product will also enhance hydraulic systems, as proven in a report preformed by Dyson's Analysis. LC20 can also be used as a cylinder preparatory storage oil (squirted into the individual cylinder) in automotive and small engines to clean carbon deposits and keep rings and cylinders from rusting during storage. 2-cycle and 4-cycle engines that have stuck rings can be unstuck with LC20. Download a copy of the LC20 MSDS Here. Please check out our testimonial page. We have hundreds of satisfied customers! © copyright 2007 LCD, Inc. All Rights Reserved.